Please note before making your purchase online check out our prices. When we set our pricing we look at online pricing. Chances are we are selling the same firearm for the same price if not lower than online prices. We do the same when we price our accessories. We will not compete with online businesses but we want your business and try to price firearms fairly so you can keep your business local. Of course you can buy something face to face and have a local dealer back you up if there is a problem with the firearm. Beware of some online retailers selling used or reconditioned firearms as new. I have had my customers have this issue in the past. Either way we value you as a customer and will treat you right. - THIS FEE IS CHARGED WHEN YOU PURCHASE A FIREARM FROM ANOTHER COMPANY AND YOU WANT IT SHIPPED TO ME AND I TRANSFER THE WEAPON TO YOU. THE COMPANY MUST HAVE A COPY OF MY LICENSE ON FILE IN ORDER TO SHIP THE FIREARM TO ME. - THIS FEE IS CHARGED WHEN YOU WANT TO SELL A FIREARM PRIVATELY AND WOULD LIKE IT TRANSFERRED TO THE PERSON YOU ARE SELLING IT TO. THIS PREVENTS THE FIREARM FROM BEING SOLD TO SOMEONE THAT IS NOT ABLE TO OWN A FIREARM DUE TO CRIMINAL OR OTHER HISTORY. 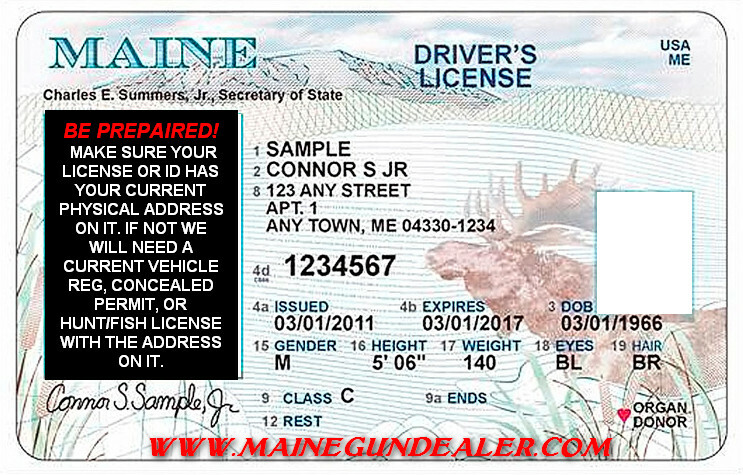 A CURRENT STATE OF MAINE DRIVERS LICENSE OR STATE PICTURE ID IS REQUIRED FOR ALL OF THOSE WHO PURCHASE A FIREARM THROUGH US. PLEASE MAKE SURE THEY HAVE YOUR CURRENT PHYSICAL ADDRESS ON THEM. IF NOT YOU WILL NEED A CURRENT VEHICLE REGISTRATION, HUNTING LICENSE, OR CONCEALED WEAPONS PERMIT WITH YOUR CURRENT PHYSICAL ADDRESS ON IT. NO PO BOXES. - Form 3310.4 or Report of Multiple Sale or Other Disposition of Pistols and Revolvers is a Bureau of Alcohol, Tobacco, Firearms, and Explosives form that a firearm dealer must fill out when an unlicensed person purchases or acquires two or more handguns at one time or during five consecutive business days (not including weekends or holidays). ATF Form 3310.4 must be completed in triplicate (3 copies), the original is sent to ATF’s National Tracing Center by fax or by mail, a copy is to be sent to the designated State police or the local law enforcement agency in the jurisdiction where the sale took place, the remaining copy is to be retained in the records of the dealer and held for not less than 5 years. If you plan to purchase a firearm through an online auction site or dealer located in another state you will need an FFL transfer. The firearm to be transferred must be legal to own here in Maine! If you are not sure please check state laws before bidding or making a purchase. You must have a valid Maine drivers license with your current physical address. If your drivers livense does not have your current physical address you must have a valid vehicle registration, Maine concealed carry permit, or Maine hunting license that has your current vehicle registration on it. We do not do transfers for non residents of Maine or Non US citizens. Our policy requires that you must be Maine resident and a United States citizen for us to do a transfer. How the process works: I send a copy of my Federal Firearm License signed with RED or BLUE ink to the seller, You arrange payment with the seller. The seller mails the firearm to me. You can check the tracking number provided and the day after the tracking shows delivered you can come over and fill out the federal and state paperwork and do the background check. You should be able to pick it up the NEXT day during normal business hours after the tracking shows delivered. Remember hanguns are never shipped with long guns so if you purchased a hand gun and long gun you should have two tracking numbers. Tracking can change and may not be delivered the same day as originaly supplied. So check tracking number(s) before coming to pick up your firearms. DO NOT COME THE SAME DAY THE FIREARMS IS DELIVERED AND EXPECT TO DO THE TRANSFER. PLEASE ALLOW THE TIME FOR ME TO LOG IT IN. THE NEXT DAY IS FINE. You pay me for the transfer when you come over to pickup your firearm. 1) The name and email address to send a copy of my FFL to. The ATF now allows dealers to accept FFL's by fax or e-mail so please include an e-mail address for the dealer selling the firearm. We will accept an FFL by e-mail only as we do not have a fax machine. 2) A description of the firearm to be transferred. 3) The item number and name of the auction web site if purchased through an online auction site. 4) Your contact information - Name, address, e-mail, phone number. 5) Put your name or firearm description in the title of the e-mail. Once I have this information I will send out a email stating who it is for and a description of the firearm (and auction item number if applicable) along with my FFL to the seller. After your firearm is shipped the dealer should send you a tracking number. PICKING UP YOUR FIREARM: After your firearm arrives (use the tracking number suppled by seller as I will not contact you) you will be able to pick the firearm up the NEXT day during normal business hours after the tracking shows delivered. Remember hanguns are never shipped with long guns so if you purchased a hand gun and long gun you should have two tracking numbers. Tracking can change and may not be delivered the same day as originaly supplied. So check tracking number(s) before coming to pick up your firearms. You MUST pass the background check in order to receive your firearm. PLEASE BE ADVISED YOU COULD BE DELAYED and not be able to pick your firearm up the same day. Some customers get delayed when it is their first firearm purchase, some are delayed randomly, and some get delayed everytime, and many never get delayed. The results are the same whether the background check is called in or done online. I charge $25.00 per firearm ($20.00 CASH PRICE) payable when you pickup your firearm. Shipping to Allsport Performance Inc.